Can a Felon Get a TLC License? Those who have hired felons have learned that they make good employees. Many felons will have to be willing to start over in a new field in order to find a job. Felons living in New York City with experience as a driver may want to consider obtaining a TLC license and becoming a taxi driver there. 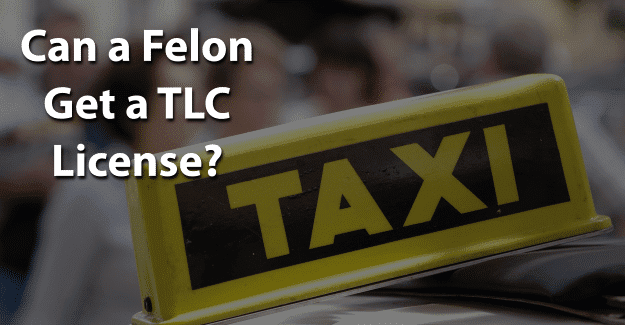 This blog post will address the question of whether or not a felon can get a TLC license. What is a Taxi Driver? What is a TLC License? How Much Does a Taxi Driver Earn? A taxi driver (or cab driver) takes people where they need to go: to the airport, their place of work, shopping, or other locations. A taxi driver must know the way around a city to take passengers to their destinations. A taxi driver has to take precautions to ensure passengers’ safety, especially in heavy traffic or bad weather. They must also follow city regulations such as how much they can charge passengers. Drivers in New York State require a Class E license and are governed by the DMV. Drivers working in New York City are regulated by the Taxi and Limousine Commission (TLC) and require additional permits and licenses. The New York City Taxi and Limousine Commission (TLC) was created in 1971 to regulate licensing taxicabs, for-hire vehicles, and luxury limousines along with commuter vans and paratransit vehicles. The TLC licenses and regulates over 50,000 vehicles and 100,000 drivers. In order to be able to drive a cab in New York City, someone must have a TLC license. This license is also known as a universal license, granting authority to transport passengers in a TLC-licensed vehicle. How Do You Get a TLC License? The first step in getting a TLC license is to purchase or lease an approved vehicle which will require a copy of the bill of sale or lease agreement. There are different categories of approved vehicles including taxi and rideshare vehicles like Lyft or Uber. The vehicle will need to be affiliated with a TLC-approved dispatch base. The vehicle will require purchasing commercial liability insurance including bodily injury liability and property damage liability. Any vehicle to be driven with a TLC license must be no more than seven years old. There are a number of requirements to complete an application for a TLC license. First, a candidate must complete a New York State DMV-certified defensive driving course no more than three years prior to the date of the application or within 90 days of submitting an online application. Someone applying for a new TLC driver’s license must attend a 24-hour TLC driving course and pass a required exam within 90 days of the date of filing the application. Any applicant for a TLC license will not be required to take the driver education training if they previously held a TLC driver’s license that was not revoked or expired. If the application is less than two years from the expiration date of a previous license, the candidate will not have to complete the course if the license was held for a total of the least 10 years. For a time period between two and five years after the expiration date of a prior license, the applicant must have held a previous license for a total of at least 15 years. Also, an applicant must pass a medical examination no more than 90 days before the date of the TLC application. If a person’s regular driver’s license has been suspended, the suspension must be cleared before being eligible for a TLC license. There are a number of legal stipulations that must be met to obtain a TLC license just as there are to obtain an enhanced driver’s license (EDL) for anyone with a criminal record. The court disposition for any crime that a person has been convicted of must be submitted along with the application. Additionally, the candidate must submit fingerprints and pass a drug test. Someone who is on probation must supply a probation status letter from the probation officer indicating that the candidate is complying with terms of the probation. It’s important to be honest when applying to become a taxi driver or for a TLC license as a New York City taxi driver. If a felony isn’t disclosed but is found on a background check, this constitutes fraud and is punishable. It is a crime to falsify an application which could result in being sent back to prison. In order to be successful in obtaining a TLC license, it’s essential for felons to be honest about their background. They are already viewed with negative perceptions of being dishonest, untrustworthy, and unwilling or unable to follow directions from authority figures. Having their record expunged can give them the chance needed to begin with a clean record and succeed in obtaining a TLC license to drive a taxi in New York City. Expunging a criminal record allows anyone to honestly state on an application that he or she has not been convicted of a crime. It’s a significant challenge, but it might be worth it for a felon that wants to become a taxi driver in New York City. Having his or her record expunged and also documenting any training programs or additional education could make the essential difference in a felon succeeding. What do you think about this blog post? Have you or someone you know been in the situation of trying to get a TLC license with a felony? What was that like for him or her, and how did he or she achieve success? Please tell us in the comments below. I have a ACD on my name till May/08/2018..can i apply for toc license? I do have a certificate of disposition which says the same.